Someone once told me a story about a place in which there were a thousand ways to enter, a thousand and one ways to exit, but no actual door. I immediately thought of the writer Jorge Luis Borges and his notion of the library as an endless labyrinth: "The universe (which others call the Library) is composed of an indefinite and perhaps infinite number of hexagonal galleries." His text The Library of Babel discusses the fundamental laws of the library, the most important being that "there are no two identical books." Nor, I would counter, are there identical readers. Some books capture you in the first line, others draw you in slowly, and then there are those books that you cannot penetrate. Each book has a unique way for a reader to enter and exit. Yet what makes all the difference is that every book contains the possibility for transportation. And so we meet Samuel Beckett's character Watt, a man defined by his eccentric manner of walking. Watt's struggle for balance, emphasized by an almost mesmerizing use of repetition, is echoed in Bruce Nauman's Slow Angle Walk (Beckett Walk), 1968. The sixty-minute video shows the artist with his arms behind his back, kicking one leg up, pivoting, falling forward, extending his other leg, and continuing this sequence again and again. Nauman takes on the quintessential characteristics of Beckett's character, personifying the circular and repetitive nature of the narrative. Using his body to gain insight into Beckett's text, Nauman renders his reading into an action. Slow Angle Walk (Beckett Walk) highlights the corporeal nature of reading, as Nauman's physical embodiment of a fictional character allows him to penetrate a narrative, blurring the boundaries between the fictional and the real. Over the course of two years Kris Martin transcribed, entirely by hand, Fyodor Dostoyevsky's novel The Idiot, substituting his own name for that of the book's protagonist, Prince Myshkin. Myshkin is the embodiment of honesty, purity, and compassion; he is, in short, the ideal hero. Martin's insertion of himself into the narrative allows him to perform more than an act of adulation; he literally begins to inhabit the book. In effect Kris Martin becomes Prince Myshkin. In another act of narrative intervention, artist Rodney Graham inserts himself into Ian Fleming's James Bond novel Dr. No. Graham's onepage insert, numbered 56a, continues the text from page 56, extending a scene in which a poisonous centipede crawls over James Bond's naked body. The supplemental text slows down the action, focusing attention on the centipede's deliberate and methodical journey up and over Bond's body. Graham's attention to detail highlights his own close reading of the novel. At the same time the actual format of his work makes us physically aware of our own role as readers. In 1997, Zhongdian, a small farming town in China near the Tibetan border, renamed itself Shangri-La, claiming to be the original site from James Hilton's novel Lost Horizon. Upon this declaration several other towns came forward, each claiming to be the original Heaven-On-Earth. With so many claims, the Chinese government was forced to intervene, and Zhongdian was officially renamed-Shangri-La. Patty Chang's video Shangri-La, 2006, investigates the possibility of taking a physical journey to a mythical place. Chang maps and lays out the text's fictional world onto the real world, inducing a transposition of the fictional and real. Artist Joachim Koester also explores the site of a novel in his photograph series From The Travel of Jonathan Harker, 2003. Using Bram Stoker's novel Dracula as a handbook, Koester recreates the journey of Jonathan Harker, the book's main protagonist. Comparing the Transylvania of Stoker's imagination with the reality of failed suburban sprawl and illegal logging, Koester posits that fictional narratives are like historical narratives; they contain the potential to leave behind a material trace in space. In Sophie Calle's Exquisite Pain, 2000, we encounter a powerful narrative of loss, suffering, and betrayal. Split into two halves, the first part of the work is a "countdown to unhappiness," chronicling the 92 days leading up to the end of a love affair. Presented like a diary, we follow the artist from France, through Russia, China, and Japan, only to end at a failed rendezvous in New Delhi. In the midst of Calle's journey we are also given a rare glimpse into her intimate relationship with the writer Hervé Guibert. Using his real-life encounters with Sophie Calle, Guibert turned the artist into a fictional character named Anna. Excerpts of Guibert's novel To The Friend Who Did Not Save My Life, passages specifically concerning Anna, are reproduced in Exquisite Pain. These pages reveal Calle's existence as a fictional character, while simultaneously highlighting the artist as a reader of Guibert's novel. Exquisite Pain is an intricate exploration of Calle's role as both an author and a reader, as through her reading of her past she is able to rewrite her own history. Allen Ruppersberg explores his own role as a reader in the drawing series The Gift and the Inheritance. A series of detailed pencil renderings, each piece depicts a single book from the artist's library. The drawings also come with the promise of the book itself; the buyer is bequeathed the physical copy of the book from Ruppersberg's library after his death. The Gift and the Inheritance investigates the significance of the books we choose to surround ourselves with and the ones that we seek to return to time and time again. The notion of a text's destination is explored further in Kris Martin's piece End-point of The Bells (E.A Poe), 2005. At first glance the piece seems like a blank sheet of paper with just the title and author written in pencil below, but upon closer scrutiny, we can see the final period of Edgar Allan Poe's text collaged directly into the center. The piece poses several questions: How does our role as the reader continue when the literary text comes to the end? Do we move on to another book, carrying the knowledge of one fictional world into another? Or do we add the book to our library, safe in the knowledge that we can return at a later date? These questions bring us back to Borges' idea of the library as the site of infinite knowledge and endless possibility. The library is, for me, the place without a door, its entryways and exits made possible by reading the books that it houses. 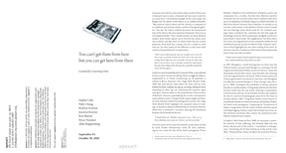 You can't get there from here but you can get here from there explores the complex relationship readers have with the texts they inhabit. It is a site where narratives become real, characters search for authors, and readers literally reside in the text. Or as a collection of works, it is, itself, the beginning of a library. This exhibition is supported in part by the Danish Arts Council. apexart’s exhibitions and public programs are supported in part by the Andy Warhol Foundation for the Visual Arts, Carnegie Corporation of New York, Edith C. Blum Foundation, Mary Duke Biddle Foundation, The Greenwich Collection Ltd., The William Talbott Hillman Foundation, and with public funds from the New York City Department of Cultural Affairs and the New York State Council on the Arts.